In 1996, Capcom revived a near dead survival horror genre when it unleashed a surprise hit on PlayStation. That game was Resident Evil. It quickly became one of the industry s most prominent game series and, quite rightly, went on to sell millions. A sequel was inevitable, and Resident Evil 2 stepped up to become an instant classic. Now, Capcom has rebuilt the game for the current round of consoles and, more than two decades after it first graced our cathode ray tube-powered small screens, a whole new generation of gamers can experience this classic firsthand. Resident Evil 2 begins shortly after the events that transpired in the ill-fated mansion laboratory of its immediate predecessor. With the T-virus and all relating evidence believed to be destroyed, the remaining members of STARS (Special Tactics and Rescue Service) returned home. But as you watch the gorgeous Resident Evil 2 introduction, it is made apparent that the heroic efforts of Jill Valentine, Chris Redfield and Rebecca Chambers came just a little too late. The infamous Raccoon City has already fallen, its inhabitants deceased... or undead. It is here where our two unwitting protagonists, Claire and Leon, meet. Following a rather nasty car crash instigated by an unpleasant horde of zombies, Claire and Leon are left separated and must find their own way through the survival horror. Players must first choose the character they wish to play as before the game can begin. There is a different scenario for each, and although their paths are similar they will both experience terrors the other will not. Resident Evil 2 s monster bestiary is admirable and extensive. On this occasion you ll encounter zombies, rabid dogs, Lickers, triffid-like creatures, mutant spiders, giant alligators and an over-sized moth of sorts. Weapons, ammo and herbs are more liberally spread here than in the first game, but players are again limited to storing the contents of their inventory in magically linked boxes. It does makes the game easier to manage, though. Things are also helped by a modern overhaul of the camera and controls, with an over-the-shoulder mode making this remake feel intuitive for players who weren't around for the first wave of survival horror shooters. 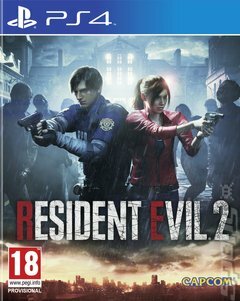 Resident Evil 2 still stands out as one of the greatest games of the PlayStation generation and with this massive modernisation for the 21st century it s as playable now as it was back then. A true classic.